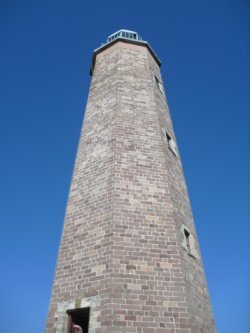 Cape Henry Lighthouse - Worth a visit? Love lighthouses and history? 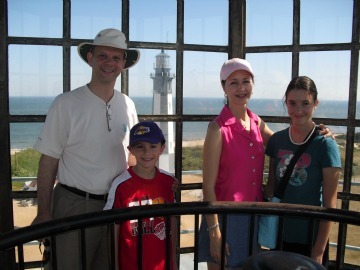 Then Cape Henry Lighthouse is the place for you. But if you can't stand heights, can't handle almost 200 steps, and are used to flashy entertainment, you'll probably think it's not worth the money. Cape Henry Lighthouse was built in 1792. It was the first public works project of the US Government. George Washington personally reviewed the buildings construction which started in 1791. It cost a total of $17,700 to build. The result was an octagonal structure which rises 72 feet and overlooks the entrance to the Chesapeake Bay. Enter through a small gift shop filled with souvenirs and lighthouse-themed gifts. Then it's time for the steps. Lots of steps. (Did I mention steps?) Keep in mind that there is no elevator, and go up and down the steps are not for those with heart or knee conditions. After climbing 90 or so steps, you may begin to question if it’s really worth it. 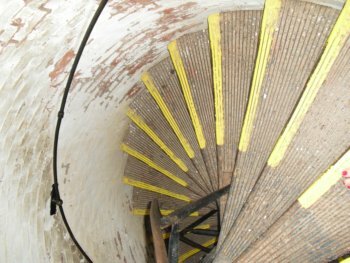 But once you reach the top of the 191 steps, you'll be glad you did once you see the amazing views of the bay, passing ships, and black and white new lighthouse which was built in 1881. It's 191 steps to the top! So is it worth the $8 admission fee? To be honest, I visited on a day it's free, so my family and I enjoyed it. Had we spent the full $18, we would have found it a little pricey. Still, if you're really a lighthouse fan, or if you get a deal, you'll really enjoy the experience. On a hot day, bring water. You'll need it! Watch your step going down! Click here for the lighthouse website.